Bira i platu-mo yanggen guaha taotao gi lamasa na kahulo' ya må'pos. Turn your plate if someone at table gets up and leaves. This folk belief isn't held by everyone. In fact, from asking around, I'd say it is practiced by only a certain number of people. Most of the people I talked to don't practice it. Some have heard of the belief, and many haven't heard of it at all until I asked them. And these were older people. The idea is that, by turning one's plate, the person leaving will make it safely to his or her destination. 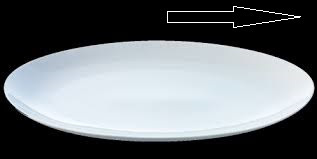 As soon as the person leaves the table, give your plate a rotation. A full one; 360 degrees. It will prevent the person leaving getting into an accident or meeting some other misfortune. The practice raised my suspicions and I inquired among my Filipino friends and, yes indeed, this belief is also found among them, though not all practice it. They call it "ikot plato," the turning of a plate. They also do it for the same reason; the protection of the one leaving. The majority of the older people I talked to had heard that some people do this, but they didn't. 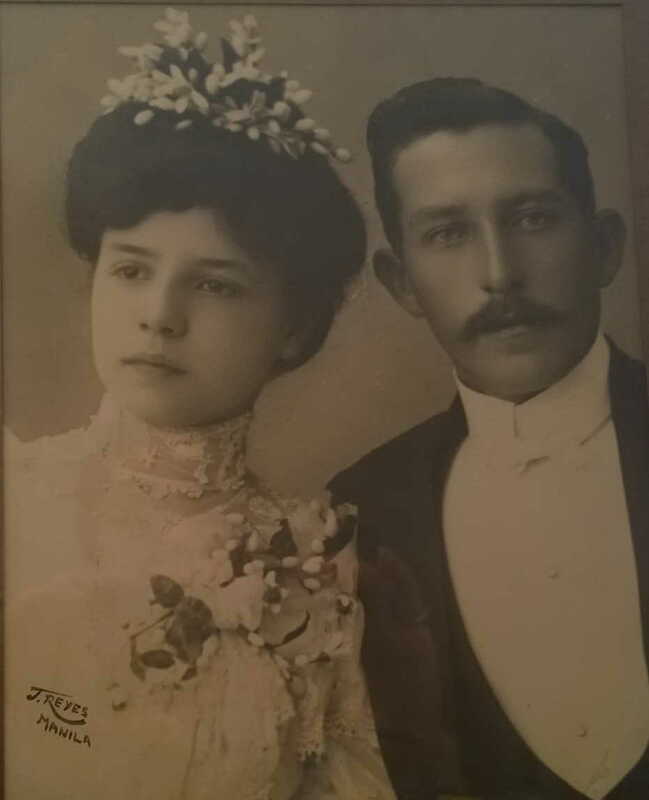 Nor had their parents and grandparents, so we're already going into the 1890s if we're talking about an 80-year-old's grandparents. And, yet, there are some who say that their grandparents did practice this, and that takes us back to the 1890s as well. ...or Pagan. Not the picture. But the place of work. The picture is definitely Agrigan. An Englishman named H.T. Williams tried to make money here in the Marianas in the 1880s. 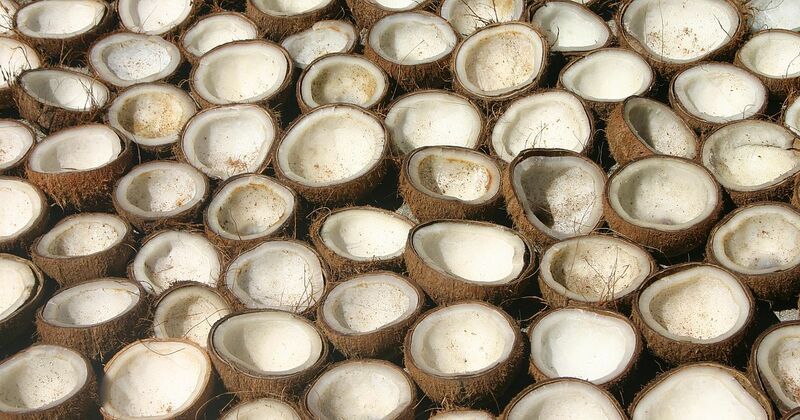 He was up in Saipan in 1885 seeking money-making opportunities and one way to make money in those days was through the sale of copra, the dried meat of the coconut. The oil extracted from the dried meat could be used in a variety of products that needed a dose of oil in them. Think of soap, for example. Copra production was found everywhere in the Marianas but the boon to doing it in the northern islands, like Agrigan or Pagan, was that there were no property owners! It was all government-owned, and an entrepreneur only had to secure approval from the Spanish government to lease the entire island. Williams was not the only one to seek his fortune in northern islands copra. Williams recruited forty Carolinians living in Saipan to work on the coconut plantations in Agrigan or Pagan that year. The contract stated that the work period would not exceed fifteen months. The men were to be paid three pesos per month, with a six peso advance. Williams was to provide for their daily meals and to transport them back to Saipan within that fifteen month period. Why Carolinians? There were indeed Chamorros living on Saipan in 1885 but, at that time, the Carolinian community was still the majority of the Saipan residents. Saipan had zero human residents from around 1740 on, thanks to the Spanish policy of relocating everyone north of Luta to Guam or Luta. It was just the birds and animals on Saipan for the next seventy years or so. Around 1815, Carolinians were allowed by the Spanish government to settle on empty Saipan, and the Chamorros (mostly from Guam, a few from Luta) followed behind them in very small numbers. The Chamorro population began to soar by the end of the 1800s and by the early 1900s the Chamorros became the majority of the Saipan population. But, in 1885, it was still a Carolinian majority and they were available for hire. The Chamorro settlers were busy tending their own farms; too busy to be hired in big numbers to help other ventures. The Carolinians at that time did not farm in the same way the Chamorros did, with their almost 200 years of Spanish experience with the plow and hoe. The Carolinians fished and planted in the old, island way; yam and taro. Other foods, like breadfruit, didn't even planting. Just pick them off the tree when edible. Less time was needed for these, compared to western farming, and so there were Carolinian men available for hire. We have the names of the Carolinian men hired by Williams in 1885. Many of the family names are still around on Saipan to this day. I am listing them here in the way their names are spelled in the document. Keep in mind that the spelling comes from Spaniards (and Chamorros) who heard the Carolinian names with their Spanish and Chamorro ears. Thus, the spelling. I am also putting the more modern way of spelling these names. 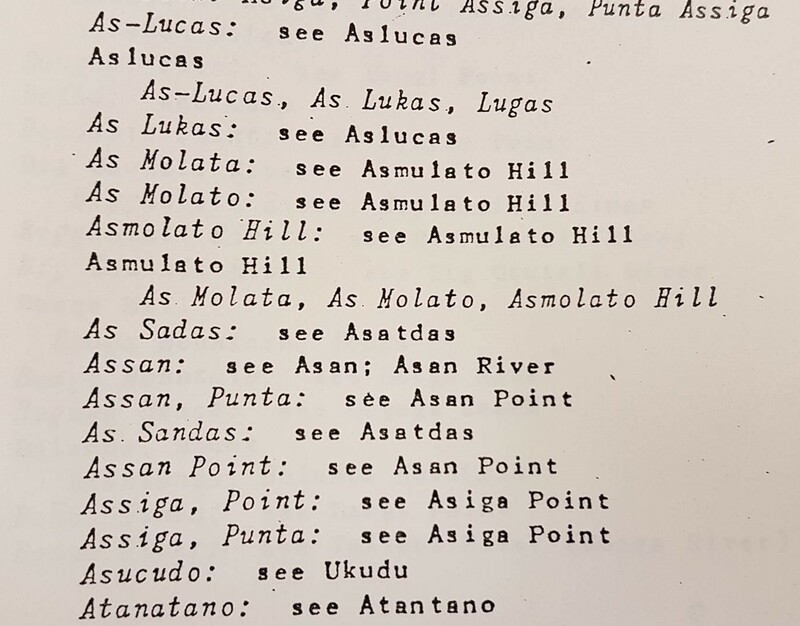 Included in the list is one man from Satawal, spelled Sataguat, which would be the Chamorro way of pronouncing Satawal. Satawal is one of the many islands where the Carolinians of Saipan originated. In other words, this man from Satawal was from the same ethnic group as the Saipan Carolinians. But he is not baptized; otherwise, he would have had a Christian first name, as all the others do. Matagolai is a name many people think is Chamorro, since it's a coincidence that it seems to be made up of two Chamorro words : måta (face/eyes) and gollai (vegetables). But an older Carolinian told me in the 1990s the way it is pronounced in Carolinian, and documents show that the first Matagolai recorded was a Carolinian. Some of the more familiar last names to me here are Rabauliman, Olaitiman, Satur, Rogopes, Taman (Candy, the singer), Kaipat, Rogolifoi, Rangamar, Kapileo, Lisua, among the others. Saralu calls to mind the Saralu singers. Malua Peter, a well-known lady in Saipan, is from the Angailen clan. There is an area on Saipan called As Rapugao, after the family. A lady from the Parong family married into the Chamorro Sablans, which gave birth to one of Saipan's mayors after the war, Elías Parong Sablan. If there are other names that are spelled differently today, leave a comment. What we have is a document spelling out the contract between Williams and these hired men. Whether they actually did go to Agrigan and completed their work is not known (yet). When the contract needed to be signed, the names of the Carolinian men were all written down by the Chamorro clerk. But the Carolinian men could not sign their name; they had not been taught to read or write, since they lived the traditional, island ways from before the Europeans' arrival. Even up to American times, a good number of Chamorros, especially the women, could not sign their names as well. So, instead, they made a cross with the pen on their names, which the clerk pointed to. Some people think this is where the last name "de la Cruz" comes from, which means "of the Cross." This may have been true in some cases, but not in every case, and, I suspect, not in the majority of cases. If that were really the case, then all these Carolinian men would have then become known as "de la Cruz" since none of them could sign their names, but only draw a cross next to their names. This song was, so I am told, originally a Chuukese song written by a prolific composer by the name of Nichon, who was born blind. 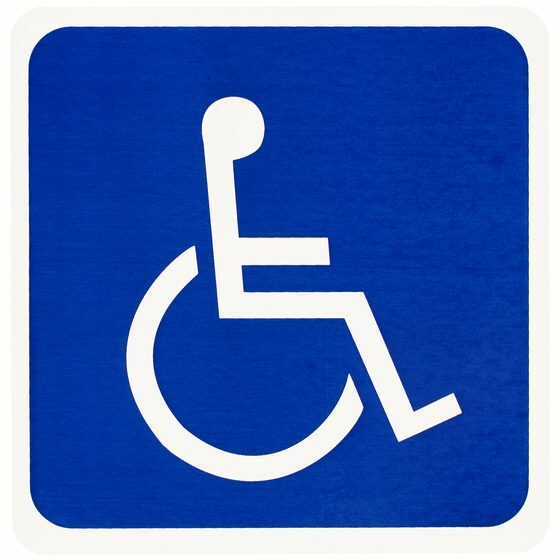 The song talks about him being born with a disability. Later, a man from Saipan named Alfonso Saures translated it into Chamorro for a little girl in Saipan, who was his neighbor, who also had a disability. Tuhu i lago'-ho kada hu konsidera todo este siha i hu padedese. 1. Ai na nina'masi' yo' na finañågo, inutit yo' na påtgon i mafañago'-ho. 2. Olaria mohon ya bai hu gefsaga, sa' gaige yo' på'go gaige gi chatsaga. Olaria is one version of the word ohalá. Ohalá comes from the Spanish word ojalá, which means, more or less, "God willing." It comes from the Arabic word for God, Allah. The Muslim Moors ruled over much of Spain for hundreds of years till 1492. All those 700 years or so of Moorish presence in Spain left many marks, including on the Spanish language and, from Spanish, on Chamorro! Originally, Chamorros said ohalá, just as is said in Spanish. But, over time, many Chamorros started pronouncing it olåra, and adding the word mohon which is a Chamorro word meaning "if only." Other Chamorros changed it to ola mohon, and, as this singer renders it, olaria mohon, and many speakers shorten mohon to mon. Despite all these different versions, Chamorro speakers understand what is meant by all of them. Såbanas å'paka' or balutan å'paka'. 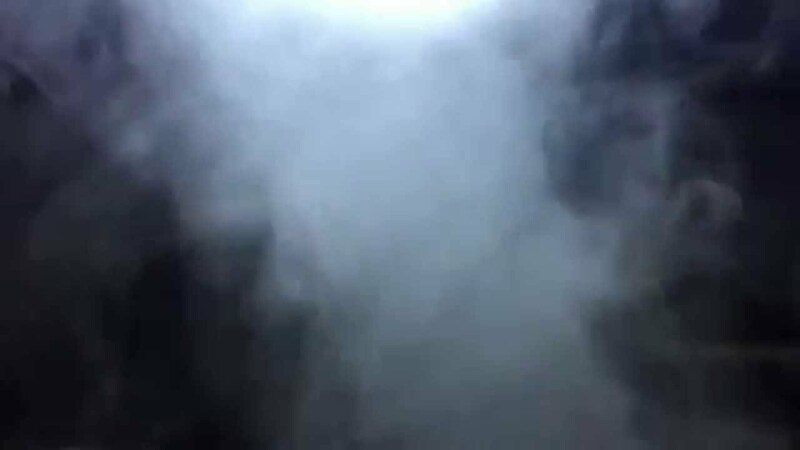 Either term is used by some older people to describe a sheet or ball of mist rolling or floating in the distance. Balutan means "a bundle" or "a bale." It can also mean food that is packaged, but not only that. Many different things, besides food, that are bundled up, packaged or gathered together can be balutan. When people saw a mist in the distance, in the old days, the elders would tell everyone to make the Sign of the Cross. I have never seen a ghost or a spirit. Nor have I heard voices of a ghost or a spirit. I have even spent the night in allegedly haunted places. But I have never seen or heard a ghost. I joke that the ghosts don't like me. I feel discriminated! Kidding. It was during the summer of 1982 or 1983. I was 20 or 21 years old. Two of my friends, around the same age, picked me up one night. We didn't know what to do so we decided to just drive down South. In those days, driving South was a big deal. I was sitting in the back while the driver and my other friend sat in front. At one point, as we were going up the hills just after you pass Agat, I leaned forward and rested my elbows on the back of the driver's and passenger's seats so I could listen more closely to and talk with the two up front. In those days, more than now, with the old, two-lane road, there were a lot of dips and crests. You really went up and down on that old road, especially on that stretch by Mount Lamlam. Just as we reached the top of a crest, and were about to go down into a dip, right after we passed Mount Lamlam to our left, our conversation stopped but I was still leaning forward. There was complete silence. Not even the radio was on. As we were on the crest, we could see the high ground of the next crest. 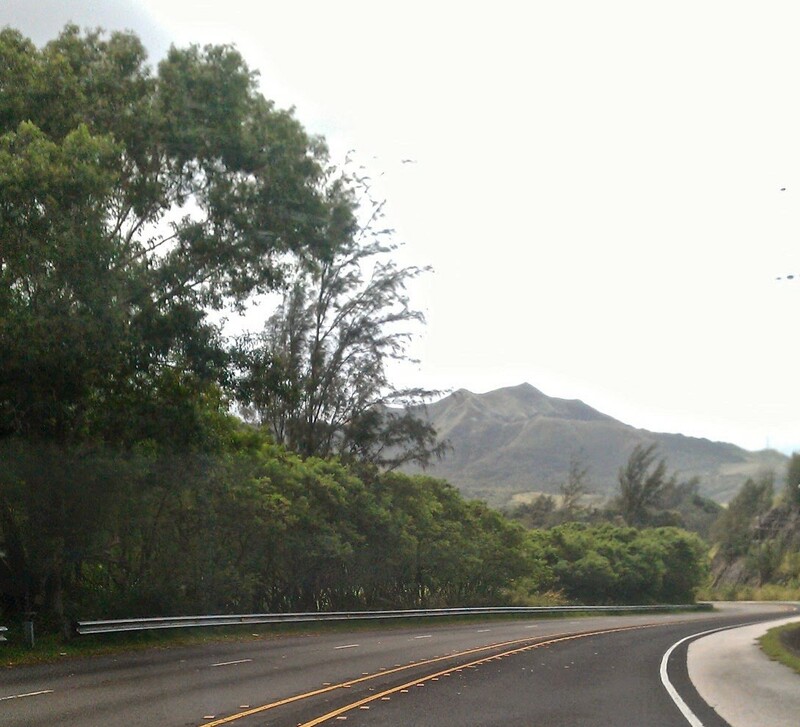 Just as our car was turning down into the dip, I saw a hazy, whitish reflection on the road on the little hill just before us. It was not blowing; it was stable. But it shimmered. There was a slight vibration or movement to it. And it seemed to have a defined, rectangular form. At first I thought our headlights were beaming onto the side of a cow stuck in the middle of the road. I thought it had better move or else we would crash into it. Then, all of a sudden, the entire mist, as a single body, swooshed ever so gracefully to the right, going into a thickly wooded valley. It moved as if it were the body of a cow, except that I didn't see any legs, tail or head. Plus the fact that I could see through the mist and see the asphalt road behind it. It couldn't have been a cow, or any animal for that matter. It was a mist, a såbanas å'paka' or balutan å'paka', except that it behaved very strangely. Stable, yet shimmering. When it swooshed to the side, it didn't have an awkward start. It moved like an animal moves when it makes up its mind to get out of the way of a car, except that this mist moved faster than any cow could. The mist seemed, for lack of a better word, "alive." It didn't evaporate; we didn't drive into it. It swooshed gracefully out of the way, to the right. I kept silence, thinking I was the only one who it. But my inner reaction was just too strong that it had to come out. And so did the other two, because all three of us at the same exact time, just seconds after seeing this mist, blurted out, "Did you see that?" And we all described what we saw, and we all saw the same thing. The next day, I shared this experience with someone and he said that there are many trails in the country side of the island used by the ancient spirits. Perhaps, he suggested, the mist was one manifestation of these spirits, as a trail could have gone from the mountains, across the road, into the valley and down to the sea. I have no idea what I saw and what caused it, and I won't draw any conclusions. For all I know, it has a perfectly natural explanation. It is a lost moment, which I cannot retrieve and put under a microscope for analysis. All I have is a memory of something very startling and puzzling. Born on Guam in 1885? Mention the name Narruhn to a Chamorro and s/he probably will give you a blank stare. But the Narruhns are a well-known family whose branches extend to the Marshalls, Samoa, the U.S. mainland, Pohnpei and Chuuk, and other places besides. Apparently, though, there is a small and brief Guam connection, too, with this family. Frederick Carl Narruhn was a German who immigrated to the United States in the 1870s. In 1879, he enlisted in the US Navy. He eventually became a US citizen. After the Navy, he bought a schooner, called the Neptune, and sailed the Pacific. He went many places. In Samoa, he fell in love with a New Zealand lady and married. But, off he went again to other lands, his wife in tow. By 1882, Narruhn had made Pohnpei his base of operations, doing business selling merchandise and transporting goods and passengers from here to there. It's not surprising that he would have gone to Guam on occasion. It is documented that several Western businessmen and settlers traveled from the Caroline Islands to Guam in the late 1800s. By 1886, the Carolines were under Spanish control, just as the Marianas had been far earlier in time. There was money to be made on Guam, too! It seems the Narruhns were in Guam in 1885, just in time for Mrs. Katherine Narruhn to give birth to a son, named Frederick, after his father. According to several documents, this Frederick states Guam as his place of birth. It is not certain how long the Narruhns stayed on Guam after baby Frederick's birth. But, according to Frederick (junior) himself, by 1894 he was living in Manila, where his father had sent him to get an education. 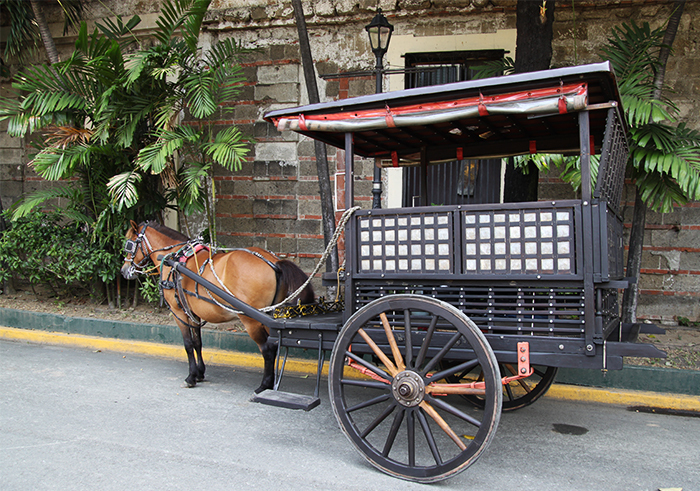 While in Manila, with its strong layer of Spanish culture, Frederick became more known as Federico. He married a pretty Filipino Spaniard, Concepción Matti, the daughter of two Spaniards living in the Philippines. In time, both of them moved to California, where they died in the 1960s and 70s. On a ship's passenger list in 1919, Federico's place of birth is listed as Guam, MI (Mariana Islands). On a passport application form, Federico states his place of birth as Guam. As I mentioned, the Narruhns can be found all over the Pacific, from east to west. 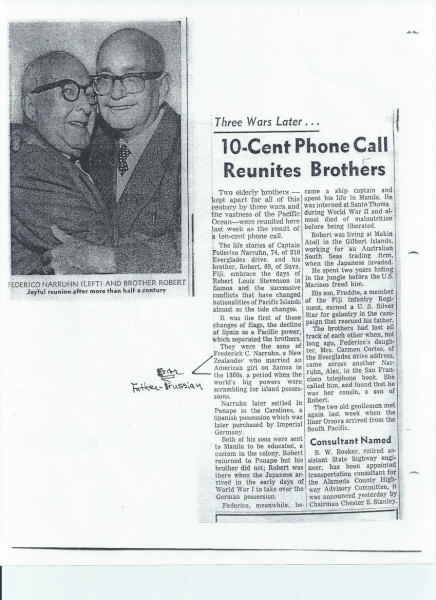 At times this meant that the family separated and didn't see each other for decades and decades! This happened between Federico and his brother Robert. Quite by chance, though, they met each other again in California in their senior years. Today, there are Narruhns living on Guam, coming from various places in the Federated States of Micronesia and beyond. I wonder if they are aware that a senior member of their clan was actually born on Guam during the Spanish period. Mungnga ma fa' champulådo i atulen teok. Don't make a mess of things, in other words! Atule is a porridge made of ground corn, water and coconut milk. Teok means "thick" as in a thick consistency. Coffee, blood and soup can all be teok. 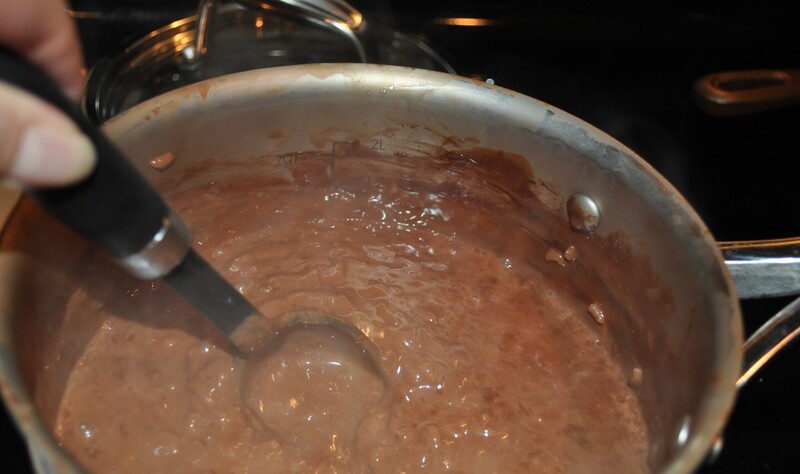 Champulådo is another kind of porridge, made of rice, condensed milk, chocolate and sugar. If you meant to make atule, and it ends up being champulådo, something went wrong. From the very beginning, the Catholic missionaries promoted the veneration of the Christian Cross among the Chamorros. The early Spanish missionaries called the Cross the båbao Yu'us in Chamorro, meaning the "emblem, standard or banner" of God. The missionaries planted a Cross in the villages they entered. They raised a Cross on the places where missionaries were killed or were buried. 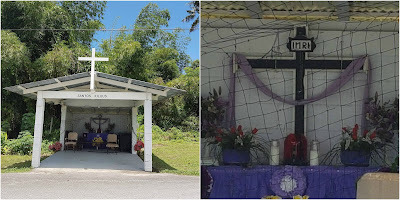 And they planted crosses along the roads going through the land, especially the interior of the island, because the Chamorros were so fearful of the aniti or spirits. The missionaries taught them that the Cross of Christ would protect them. The missionaries were not totally successful! To this day, many Chamorros are fearful of the jungle and interior of the island. Before long, large crosses were placed all over the island. A whole section of Hagåtña was named Santa Cruz, which means "Holy Cross" in Spanish. In Chamorro, "Holy Cross" is translated to "Såntos Kilu'us." When people would pass a Cross on the roadside, they would take off their hat, bow or pay some sign of respect. More devout souls would kneel and pray before them. The oldest Santa Cruz (Holy Cross) that remains intact to this day is at Atantåno', a low-lying and swampy area just before the main gate at Naval Station, before one makes the left turn to continue driving to Hågat or Santa Rita. The cross was possibly erected in 1785; the same time the road that ran in front of it was built. If not, then it was erected in the 1800s when, it seems, a commemorative marker was placed in this spot. The area was used for the production of coconuts (copra) and rice. During the Spanish colonial period, May 3rd was the Feast of the Finding of the True Cross. That feast commemorated the discovery of the true cross on which Christ died by the Empress Helena. Many Chamorro families made this feast their family promesa, promising to observe and celebrate this feast every year with a novena and a feast on the ninth or last day. Up to now, there are families that continue to observe this family promesa or devotion. 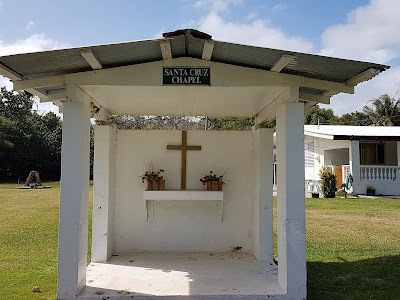 A few families are so devoted to this promesa that they have built small chapels to the Santa Cruz as permanent structures, usually on the side of a road. They are usually simple, but are cleaned up and decorated before the start of the novena. 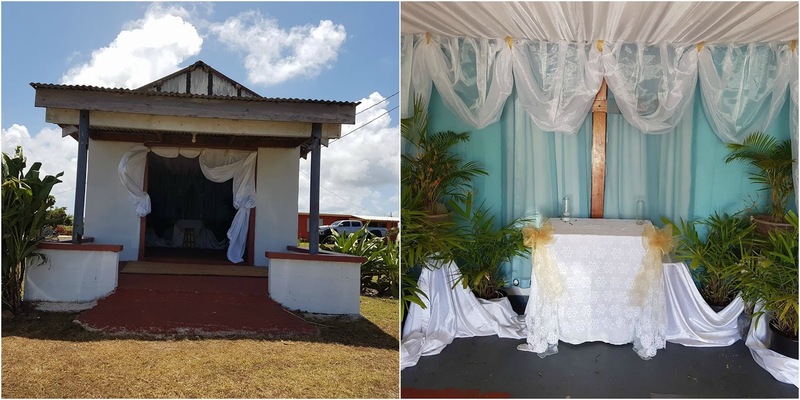 Here are some photos of just some of the private, family-owned Santa Cruz chapels found on Guam. Besides family-owned, private chapels of the Holy Cross, some churches erected large crosses in front of the parish church. In this picture, we see, on the left, one such large cross in front of the pre-war Sumay Church. In the picture on the right, a modern cross sits across the street from Humåtak Church. This cross was built by the late Jesus "Pat" Quinata at the direction of Påle' Eric in 1997. It is a story full of intrigue and scandal. It was made into a movie. But hardly anyone remembers it. 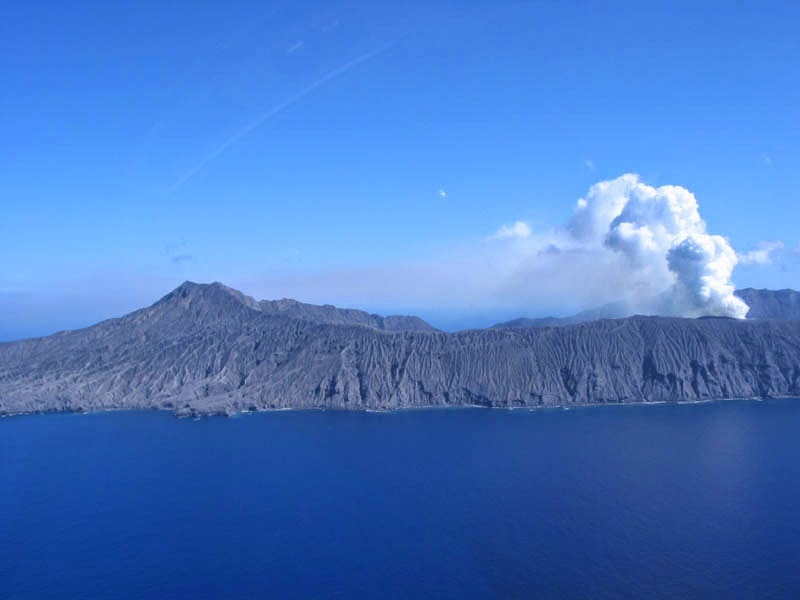 Thirty Japanese men or so, stranded on a tiny volcanic island in fighting a war that was over, struggled in deathly competition over the one and only woman left on the island. She was called the Queen Bee, with the men willing to fight and kill over her. 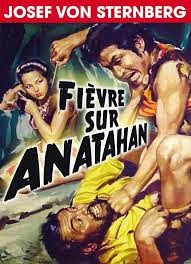 Prior to all this, the island of Anatahan had been used by the Japanese before the war for copra production. Some forty Chamorros and Carolinians worked the copra farms on Anatahan under Japanese supervisors. 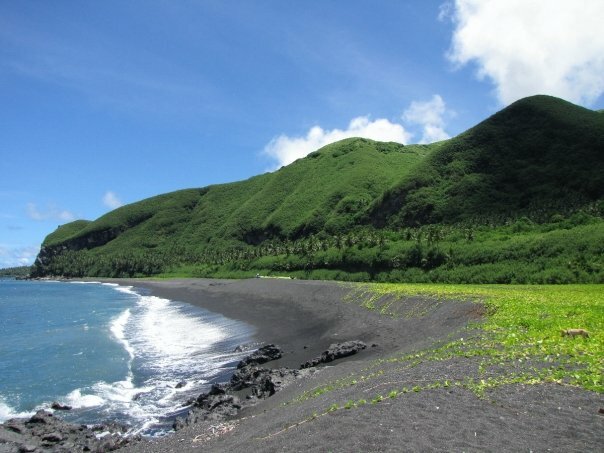 Eventually, the islanders left Anatahan and only the Japanese remained. One of the few Japanese who remained on Anatahan was a woman of Okinawan background, Kazuko Higa, married to a man named Shoichi Higa. Concerned about his sister who was living in Saipan, where the war would bring all its death and destruction, Shoichi left Kazuko on Anatahan while he went to Saipan to check on his sister. He never came back. Kazuko then came under the roof of another man named Higa, with the given name of Kikuichiro. The Japanese population of Anatahan increased dramatically in June of 1944 when a convoy of Japanese ships was attacked by American planes. 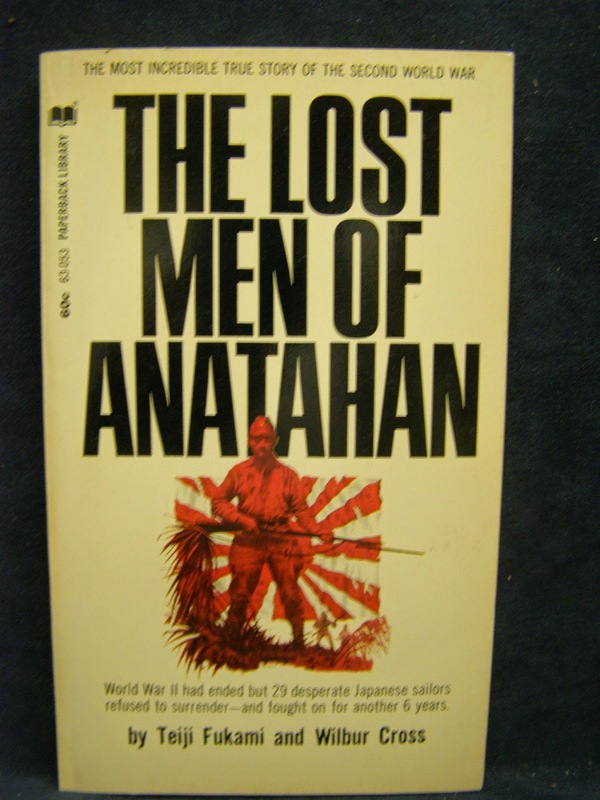 As the ships sank, the 30 Japanese crewmen swam to safety at Anatahan. As the only woman on the island, surrounded by thirty-some men, trouble was bound to happen. First off, her romantic partner Kikuichiro was shot and killed by Gensaburo Yoshino in 1946. Yoshino in turn was stabbed to death by Morio Chiba. Chiba then died naturally. In order to prevent more fighting over her, she "married" a few more men. One of them, Riichiro Yanagibashi, "drowned" in the ocean (but who really knows if that was truly accidental?). 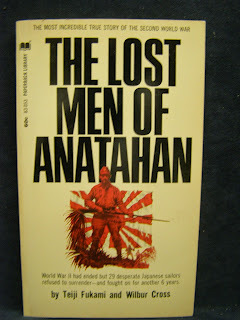 In all, around 11 men died on Anatahan throughout those years. Some were accidental and some were murdered. Feuding was not just over Kazuko, but also over who would be the leader of the small colony. By 1950, the talk was that the men were done competing over Kazuko. If she were eliminated, they thought, the men would spare each other! 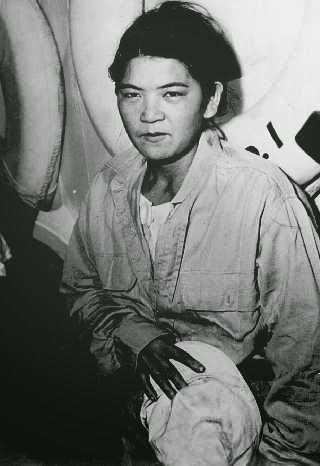 When Kazuko found out that her life was in danger, she fled into hiding and in time flagged a passing American ship to rescue her. Another account says a Japanese working for the US government went to Anatahan and convinced Higa to surrender. 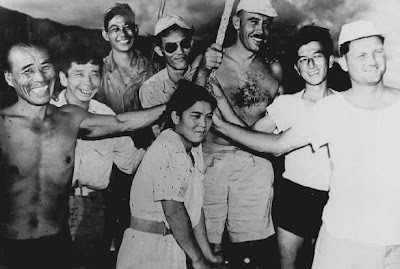 The man 2nd from the left is Gregorio Sasamoto, a Japanese resident of Saipan married to a Chamorro, Genara Aguon. I know his son very well. The Japanese men, however, refused to give themselves up, thinking that American claims that the war was over were just lies. Slowly, a few of the men changed their minds and thought of surrendering, but a hard-core patriot dominated them and threatened to kill any man who thought about surrendering to the Americans. But on June 30, 1951, the remaining 19 Japanese men finally called it quits. 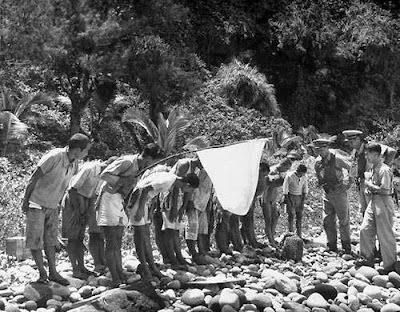 When the Americans dropped letters from the men's own family members urging them to surrender since the war was over, the Japanese men then believed. They waved white flags upon seeing American planes after that. The Americans sent boats up to Anatahan to pick up the Japanese men. World War II finally ended for them, six years after the fact! It is said that, in time, Kazuko made it back to Okinawa, where she ran into her first husband, quite by chance. They became husband and wife again. Life has a way of bringing things full circle. The portrayal of Kazuko's saga on Anatahan, with its mixture of sexual intrigue and murder, was ripe for the marketing of books and movies on the subject. Astumbo is a pretty recognizable place name on Guam. Astumbo is a neighborhood within the municipality of Dededo, situated in between Ukkudu to the south and Gugågon to the north. But how did this area get to be called Astumbo? One clue is immediately seen in the beginning of the name. The syllable AS is a Chamorro word more or less meaning "at" when used in place names. There are many places on Guam whose names begin with AS. It often means "at so-and-so's place." As Lukas, a place in Talofofo, was probably an area where a man named Lucas (Luke) lived. In Saipan, there is a place called As Palomo, probably where someone named Palomo lived. In Luta, there is the famous latte stone quarry called As Nieves, probably where a woman named Nieves once lived. 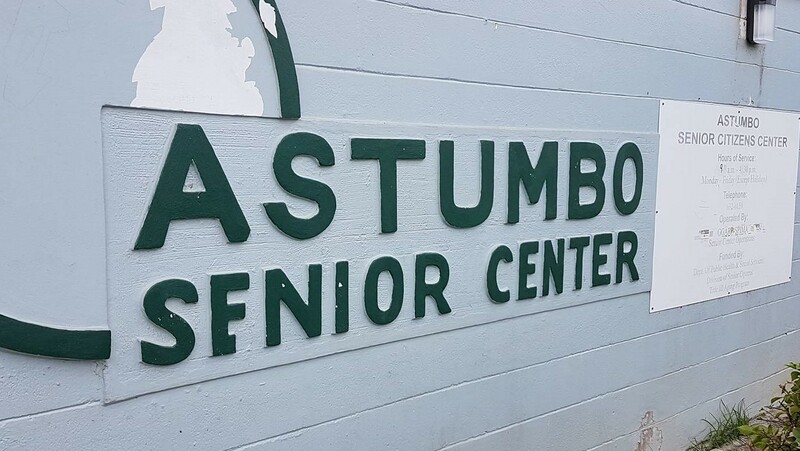 So there is a good possibility that Astumbo means As Tumbo. "At Tumbo's place." According to older people who lived in this area before the war, or who at least had ranches in this area and spent some time during the week here before the war, there was a man named Tun Ramón living in this area. 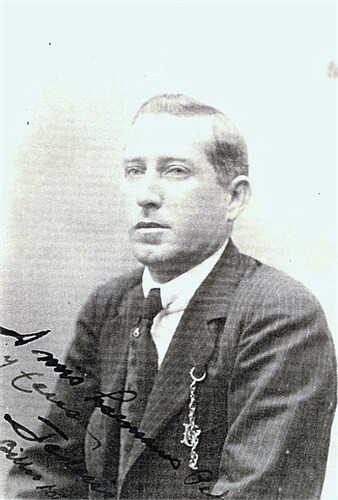 His full name was Ramón Camacho. As is often the case, he was more often called by his nickname, which was Tun Bo. Chamorros usually take the last syllable of someone's name and create the nickname from that. The nickname CHU comes from the last syllable of the name Jesús. SUS become CHU. In this case, the MON in Ramón was changed to BO. One elderly lady told me that in her father's ranch area, the neighbors were a Cruz family (better known as the Achigo' family), the Arteros and Ramón Camacho, better known as Tun Bo. Her father would sometimes send her on an errand to Tun Ramón's ranch telling her, "Hånao para as Tun Bo." "Go to Tun Bo's place." 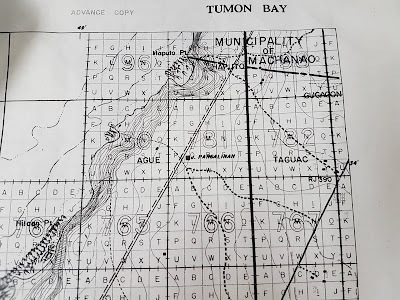 If Tun Bo was living before the war, then it seems that the area could not have been called Astumbo back in Spanish times or in the early American period. Perhaps the name Astumbo came about just prior to the war and certainly after it. One indication of this is the absence of the name Astumbo in pre-war maps. In this 1944 map, based on pre-war information, there is no place called Astumbo in the area now called Astumbo. In the top right corner of the map is a place called Gugågon. Just below that area should be Astumbo, but it is not indicated. 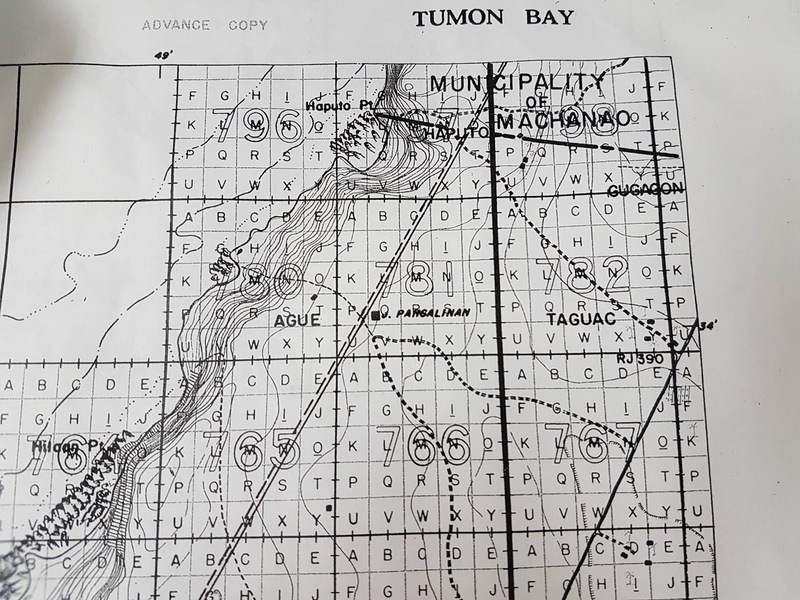 Instead, there is a place called Taguac (Tåguak), perhaps the older or original name of what is now called Astumbo. In the Navy's list of place names of Guam, compiled right after the war, there is no listing for Astumbo. 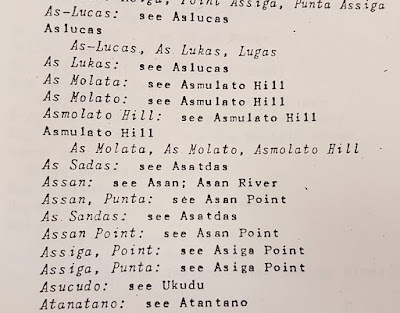 In the coming months, when possible, I will continue searching for this Ramón Camacho who supposedly lived in the area and is the Tun Bo in the name Astumbo. If any readers can provide any clues or information, please do leave a message in the comments section at the bottom of this post. Here is another example of how language changes over time. In every language, the meaning of words changes as new generations add to the possible meanings of a given word. 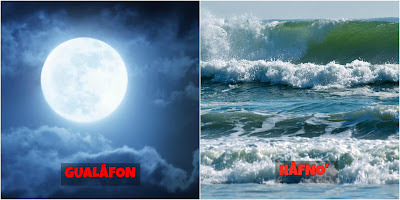 In Chamorro, take, for example, the word AFA'MAOLEK. Many people today define afa'maolek (or its noun form, inafa'maolek) as cooperation, mutual assistance, reciprocity, interdependence. But, as the video below shows, the older meaning was : reconciliation. Two former adversaries make peace. That is inafa'maolek, in its original meaning. The term can be broken down into parts. The foundation of the word is maolek, which means "good." The prefix fa' means "to make." Fa'maolek means "to make good." The prefix a means "together" or "between two subjects." Afa'maolek means "to make good together" or "between each other." The assumption here is that there had been something "bad." A disagreement, a fight, some injury or injustice. Hence the prefix "to make." Something had to be done to make peace, to make good, because prior to the fa' maolek something had been bad. It's bad, so make it good! Let's listen to these older women, all in their 70s and 80s, point this out. In the traditional and older understanding of the word, inafa'maolek presumes that enmity or hostility needs to be "made good." 1st lady : She says that it means to make good what was once "broken" (ma yamak) between two people. 3rd lady : She uses a word hardly known anymore - plaito. It means "argument, discord, controversy" and the like. From the Spanish word pleito which means the same. 4th lady : She speaks in English and defines it as "making peace." 5th lady : Once again, having had a fight is mentioned. When two people make peace, then they start to help each other. 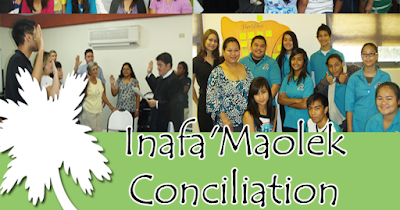 So people started defining inafa'maolek as all those other things that result from peace making : mutual assistance, reciprocity, interdependence and so on. But the original meaning always includes a prior state of enmity between two parties, which they then repaired (fa' maolek). In fact, whenever someone uses fa' maolek with their car, for example, the listener always takes it to mean that the car was repaired. Or, with a sick person, fina' maolek means the person was healed. The presumption is that prior to the fa' maolek, there was a negative condition. A car was broken, a person was sick. Once again the foundation of the word : It's bad, sick, broken, at war! Make it good! Fa' maolek! In olden times, our mañaina did certain things according to the phase of the moon or the rise and fall of the ocean tide. When planting tubers like dågo (yam) or kamute (sweet potato), the old people believed that if you planted when the tide was low and the moon was full, you would get a lot of tubers at harvest time, but their size would be small. If you planted them when the tide was high and the moon was full, you wouldn't get a huge number at harvest time, but they would be larger in size than average. Old people would cut wood for homes or for tools, cut bamboo or coconut leaves for thatching when it was low tide and during the first quarter of the moon. They believed the wood was drier in these times and would thus last longer. If you cut them when the tide was high and the moon was full, the wood would be wet and decay faster and get infested with insects. Our mañaina believed that blood would flow less, when castrating animals, if it were low tide and the moon dark or in the last days of its final quarter. If a person accidentally cut himself, blood would also flow less in these times. Our older people would make coconut oil when it was high tide, believing that one produced more oil during that time than at low tide. The coconut meat would be squeezed to get the juices out, then the drippings would be boiled and the oil would rise to the top of the pot, where it would be skimmed off. siha na såkkan ya kalan listo gue' na klåsen taotao. gi sahyån-ña såhyan koche. Långa' si Båttolo mientras kalåktos si Don Luís. Gina'chunge si Don Luís ni ayudånten-ña as Vicente. Mientras matåtå'chong i dos gi halom koche, ma repåra na kiekieto i koche. "Oi," umessalao si Don Luís, "håfa na ti man håhånao hit?" Manoppe si Båttolo, "Guaha kåmpo para dos ta'lo mås na pasahero. (Båttolo answered, "There is room for two more passengers. Ti bai hånao asta ke guaha dos mås ta'lo." ya ha apåse ta'lo si Båttolo ni dos reåt na åpas pasåhe ya humålom ta'lo gi koche. ya ha fa' nuebo na pasahero gue' ya manapåse ta'lo dos reåt ya humålom ta'lo gi koche. På'go nai guaha "kuåttro" na pasahero, må'pos i koche para Sumay. There used to be a family on Guam called the Pachecos. As far back as 1727, there was a Filipino soldier on Guam, very likely from Pampanga, named Pedro Pacheco. He was part of the Pampanga regiment, but it is also possible that he came from another part of the Philippines. In 1727, he was still unmarried. But, in the 1758 Census, he had been married and was now a widower, with possibly nine children. Five of those nine children were still unmarried in 1758 and living with Pedro. They were Francisco, Alejandro, Miguel, Domingo and María. Lorenzo, who married María Charsaga, a Chamorro name. Then there were three married daughters. Ignacia, who married the Filipino Pedro de Herrera; Bárbara, married to a man from Pago named Simon Taichigo; and María Agustina, who was widowed in 1758, having been married to a man named Cruz. There was another Francisco Pacheco living in Humåtak, whose mother was María Taitingo. What relation he had, if any, with Pedro Pacheco of Hagåtña, is unknown at this time. There was also a man named Pedro Pacheco from Pago, but whose parents seem to have been "pure" Chamorros, Carlos Lalalo and Juana Taasi. It was sometimes the case that a baby received, not only a Spanish first name, but also a Spanish surname as well. 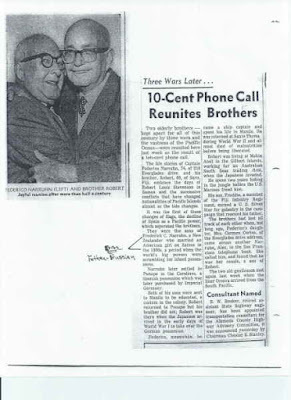 Given that the older Pedro from Hagåtña we first mentioned had five sons, you would think that the Pacheco name would continue up to the present. But it didn't. By 1897, there was only one person on Guam having the last name Pacheco. Her name was Cipriana Pacheco, and she was married to José Finoña. 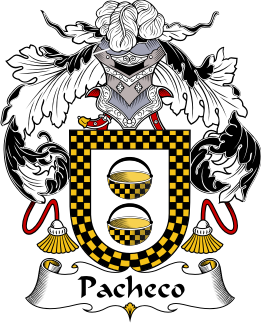 Thus, the Pacheco name was to last just one more generation, as the maternal last name of her children, who all carried Finoña as the paternal last name. The Finoña would survive, but the Pacheco would not. In fact, the Finoñas who are descendants of Cipriana Pacheco are the Familian Englis today. Many years ago, I did the family tree of an elderly lady from the Familian Englis, and when I explained that her great grandmother was named Cipriana Pacheco, she said she had never heard the last name Pacheco before. Scholars believe that the last name Pacheco started in Portugal and then some Pachecos moved to Spain, where it is found today, especially in the south and in the parts closest to Portugal. They are not sure what the name means or how it started. As far as most people are concerned, Humåtak has but one, solitary cemetery. You make a right turn immediately after the big, towered bridge, leaving Route 1 and entering the West Ginahit area and take the road all the way in and there you will find the Catholic cemetery at the dead end. No pun intended. And most people would not be surprised that Humåtak (so it seems) has but one cemetery. The village is one of Guam's smallest, so one cemetery should suffice. And, no surprise, it's the parish or Catholic cemetery, since everyone in Humåtak is Catholic. Right? Today, of course, many Chamorros are no longer Catholic but even in the 1930s, not everyone in Humåtak was Catholic. There was one Baptist family there. The head of the family was Juan Aguon Quinata, the son of Faustino Mendiola Quinata and Clara Infaña Aguon. He was born in Humåtak in 1883 and then married a Sumay woman, Elocracia Guzmán Dueñas. Her first name has been spelled in a variety of ways! Her headstone spells it Elocracia. One census spells it Elogracia. And the oldest census she is in, the 1897 one, renders her name Lucrecia. She was the daughter of José Quintanilla Dueñas and María Santos Guzmán. The couple became Baptist. Till his death, Juan read a Spanish Bible every day and lead family prayers at night. As Baptists, none of them could be buried in the Catholic cemetery in Humåtak, the only one existing in the 1930s. 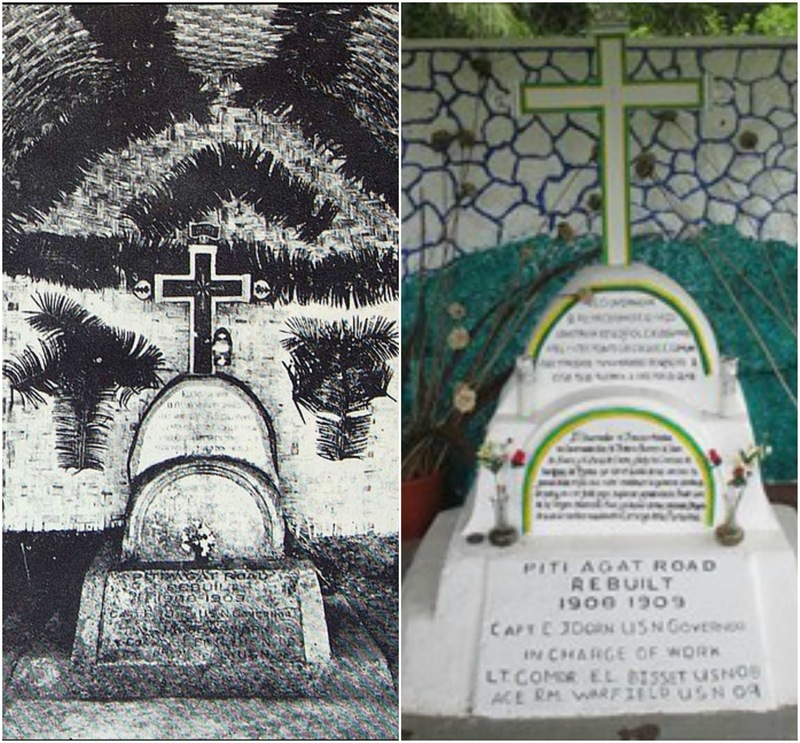 So when Juan's daughter Guadalupe died in 1934, land for a non-Catholic cemetery had to be found. I am not sure how this piece of land became the Protestant (or, at least, non-Catholic) cemetery. I'd have to research at Land Management who is the owner and who were the owners in the past. I wouldn't be surprised if this land was Juan's to begin with, but that's just a guess. Either by design or by coincidence, the Protestant Cemetery is just a few yards away from the Catholic one. It is so small; the headstones so darkened with the passage of time and the effects of the weather, that it is easy to miss when driving by. Of the headstones that still exist, the oldest belongs to Juan's daughter Guadalupe, who was born on the feast of Our Lady of Guadalupe, December 12th in 1909. I have a suspicion, then, that Juan was still Catholic in 1909 since he named his daughter after the saint on whose feast the daughter was born. Our Lady of Guadalupe also happens to be the patroness of Sumay, the village where Elocracia came from. 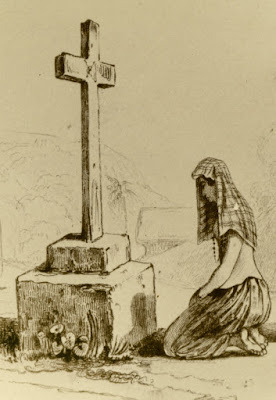 Guadalupe had married Francisco T. Manalisay, a school teacher, but unfortunately she died a young woman, being only 24 years old at the time of death. Sadly, just the following year, Juan's wife Elocracia also died, at the relatively young age of 55. Hers is the second oldest headstone in the cemetery. You can just barely make out the writing. 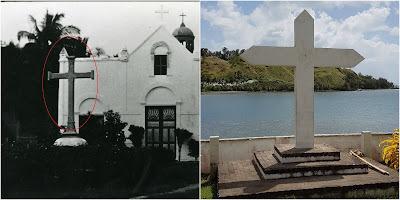 After the war, many of Juan's family became Seventh Day Adventists, but Juan remained a Baptist and played the organ at the Talofofo General Baptist Church. When he died in 1958 he was buried in this small cemetery along with his wife and daughter. Juan's headstone is in better condition. There is, finally, the grave of a stateside woman, Mary Violet Cathey (maiden name Bridges), born in Missouri. She died in Guam in 1966 and is buried in Humåtak. I do not know her story, nor her connection to the Quinatas, if any in fact exists. For all we know, there may other graves in this cemetery, but the headstones are missing. In October of 1799, the whaling ship Barclay set out from New Bedford, Massachusetts in search of seal skins. Griffin Barney was in command of the ship. After many months of travel and seal catching in various places in the Atlantic, they headed up the Pacific to Hawaii and from there to China. But on the way to China the Barclay made a stop at Tinian in the fall of 1800. Perhaps the first visit to Tinian, and indeed perhaps the entire Marianas, by an American ship. The American ship the Lydia would not come to Guam until 1802. The reports of the Barclay about Tinian state that the island was uninhabited, except by "immense droves of white cattle." The men of the ship helped themselves to abundant supplies of lemons and red peppers. Interestingly, nothing is said about the House of Taga. Perhaps the men didn't find it or, perhaps finding it, didn't know what it was, there being no one on Tinian at the time to tell them. But I tend to think that, had they seen those tall pillars, they would have simply reported seeing them, even without knowing what they were. 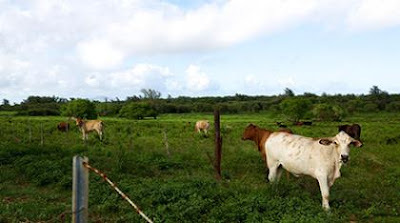 The House of Taga did not make it in the story but Tinian cattle did.